As part of my work for Bloomberg LP’s Digital Marketing and UX team, we also support the digital efforts of Bloomberg Philanthropies. This includes designing websites, logos, social assets, and various other digital initiatives. 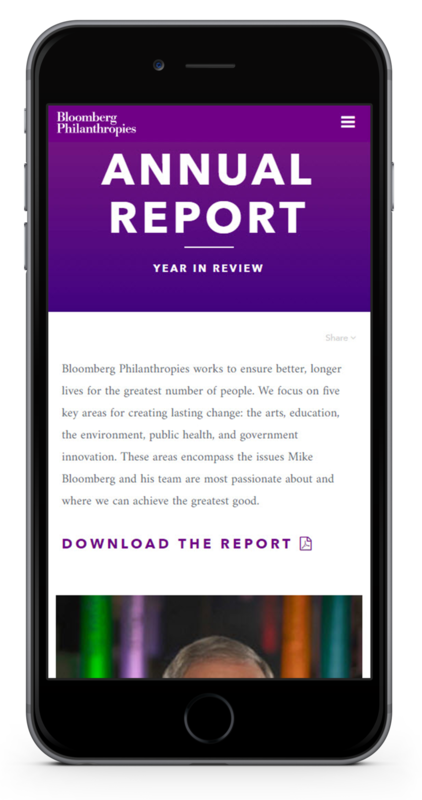 I provided website design and content marketing assets for Bloomberg Philanthropies 2017 Impact Report, highlighting their efforts in the arts, education, the environment, government innovation, and public health. In addition to designing the website for the Annual Report, I also created animated social content to promote the site and the work that Bloomberg Philanthropies does. I designed the logo and helped design the website for America's Pledge— an effort spearheaded by Michael Bloomberg with the aim of bringing together private and public sector leaders to ensure the United States remains a global leader in reducing emissions and delivers the country’s ambitious climate goals of the Paris Agreement. I designed the website for From the Ashes— a documentary about the impact of the coal industry, produced in partnership with Bloomberg Philanthropies.